FORBES (fforbes), JOHN, army officer; b. 5 Sept. 1707 (o.s.) in Edinburgh, Scotland, son of Elizabeth Graham and posthumous son of Lieutenant-Colonel John Forbes of Pittencrief, Fifeshire; d. unmarried 11 March 1759 in Philadelphia, Pennsylvania. John Forbes began his military career, after abandoning a medical one, by purchasing a cornet’s commission in the Scots Greys, dated 16 July 1735. 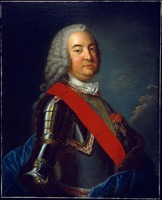 At the battle of Fontenoy (Belgium) in May 1745 he served as captain and aide-de-camp to Sir James Campbell, commander of the British cavalry. The same year he was promoted major and lieutenant-colonel in the army, and saw service in the suppression of the 1745 rising in Scotland, including action at Culloden. Again in Flanders, he served as aide-de-camp to Sir John Ligonier in the disastrous defeat at Laffeldt, 2 July 1747. The following year he became quartermaster-general on the Duke of Cumberland’s own staff, and in 1750 was made lieutenant-colonel in the Scots Greys. 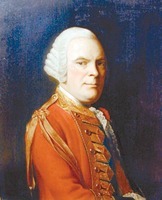 Forbes came to Halifax in the summer of 1757, as colonel of the 17th Regiment of Foot and adjutant-general to Lord Loudoun [John Campbell], in which capacity he supervised the arrest of Lord Charles Hay. Forbes was promoted brigadier-general 28 December, and the following March, probably on Ligonier’s recommendation, was given his first independent command, the expedition against Fort Duquesne (Pittsburgh, Pa.). This same assignment had lured a 2,500-man army under veteran Major-General Edward Braddock to disaster three years earlier. Much of the spring and summer of 1758 Forbes spent in Philadelphia, gathering men and means for the expedition. Difficulties in obtaining colonial troops, supplies, and wagons, together with the onset of his own fatal illness, brought irritating delays. Intercolonial trade and land rivalries flared over the route: should Forbes follow Braddock’s road, as favoured by the Virginians, or cut a new road west from Raystown (Bedford), Pennsylvania, as that colony urged? Distance, forage and supply considerations, and dangers of flooding at several points on Braddock’s road led Forbes to choose the new road, and hold firmly to his decision. When finally gathered, his force consisted of about 5,000 colonial militia, 1,400 Montgomery’s Highlanders, 400 Royal Americans, and 40 artillerymen. Convinced that Braddock’s supply system in 1755 had been so weak that a withdrawal would have been necessary even after victory, Forbes was determined to build a supply road marked by defensible stockades and forts no more than 40 miles apart. He claimed to have learned this strategy from Turpin de Crissé’s Essai sur l’art de la guerre but must have come to appreciate it from experience in Scotland and as quartermaster-general in Flanders. Forbes’ fortified road was a clear and eminently successful application of the theory. His attack was not to be a raid but a permanent conquest, and, as the Virginians feared, the road proved to be an enduring route to the Ohio country from Pennsylvania. Supervision of road construction and forward positions fell to the able Colonel Henry Bouquet, as Forbes’ “bloody flux” continued. By September, when he reported that his health was improved, Forbes could travel only in a litter slung between two horses. 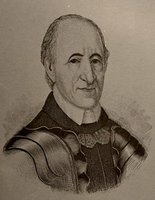 Without his order, first contact was made with the defenders of Fort Duquesne on 14 September when an 800-man advance party under Major James Grant was defeated. For ten weeks this victory seemed to the French to have secured the fort, and the garrison under François-Marie Le Marchand de Lignery was reduced for the winter. Harassed by bad weather and the unending claims that Braddock’s road would have been quicker, Forbes nevertheless made good use of time. Aside from Grant’s adventure, no contact with Fort Duquesne was made until a conference between colonial officials and Indians at Easton, Pennsylvania, in October 1758, encouraged by Forbes, had won the neutrality of the Delawares, Shawnees, and Mingos. Although late autumn brought problems for the advancing English, it weakened the French by reducing cover for raiding parties and urging their remaining Indian allies to their winter hunting grounds. By out-waiting his opponents, Forbes achieved a bloodless conquest. On 24 November, when his force was within a day’s march of the fort, the garrison blew it up and retreated. Forbes took possession of the smouldering site, which he renamed Pittsburgh, 193 miles and five months from the beginning of his road, and five days before the expiry of service of his colonial troops. In fortifying his road, Forbes intended it to be defensible against Indian and Canadian raiding parties, and the raids attempted the following winter all failed. The road was safe, and so were the frontier settlements that had been terrorized by incursions from Fort Duquesne since Braddock’s defeat. The Indians of the upper Ohio had made their peace with the victors. Forbes’ caution, thoroughness, and tenacity had succeeded; he had delivered the upper Ohio to British control. Forbes returned to Philadelphia in January 1759, bearing visible evidence of the progress of his illness. He died on 11 March, aged 51, and the colony afforded him a funeral befitting one of their own heroes. He was buried in the chancel of Christ Church, Philadelphia. BM, Add. mss, 21630–60 (Bouquet papers). Henry E. Huntington Library (San Marino, Calif.), Abercromby papers, Loudoun papers. PRO, CO 5/50; WO 34/44, 34/76. Scottish Record Office (Edinburgh), Dalhousie Muniments, GD 45/2. [Henry Bouquet], The papers of Col. Henry Bouquet, II: the Forbes expedition, ed. S. K. Stevens et al. (Harrisburg, 1951). [John Forbes], Writings of General John Forbes, ed. A. P. James (Menasha, Wis., 1938). Knox, Historical journal (Doughty). Pennsylvania Gazette (Philadelphia), 15 March 1759. DAB. DNB. J. W. Fortescue, History of the British army (13v., London, 1899–1930), II. D. S. Freeman, George Washington: a biography (7v., New York, 1948–57), II. Gipson, British empire before the American revolution, VII. A. B. Hulbert, Historic highways of America (16v., Cleveland, Ohio, 1902–5), V. Parkman, Montcalm and Wolfe, II. Lancelot Turpin de Crissé, Essai sur l’art de la guerre (2v., Paris, 1754). I. K. Steele, “FORBES, JOHN,” in Dictionary of Canadian Biography, vol. 3, University of Toronto/Université Laval, 2003–, accessed April 22, 2019, http://www.biographi.ca/en/bio/forbes_john_1707_1759_3E.html.